Lick Observatory summit on a clear day. Nothing beats it in the South Bay, except Mt. Umunhum. Nothing beats a ride up Mt. Hamilton on a weekday, although Sundays are a close second. Not much traffic. I started from Alum Rock Avenue about 8 a.m. in time to greet the commuters living on Mt. Hamilton Road rushing to work. For the first several miles there’s a fair amount of cars, but traffic thins out after that. I noticed county crews clearing chamise (greasewood) across from the Grant Lake parking lot in Grant Ranch County Park. Don’t quote me on the type of bush, but it looks like chamise. In the past, wild pigs rooted around in this area. The crews certainly wouldn’t be doing controlled burns on a day like today with high winds in play. I enjoyed mostly tailwinds climbing to the summit where 25 mph gusts made for shaky standing at the observatory parking lot. On the way up I did my civic duty by tossing large rocks off the road and saved a young bull snake from certain death by car wheels. The critter refused to budge as it sunned itself on the road. Three miles from the summit. Glorious views. Considering the cool breeze, it took a while to wake the snake from its torpor. In the last section before turning up the observatory road, Caltrans workers were installing a large culvert, which is always good to see. Preventative maintenance pays off. I counted my blessings that I can still ride to the summit in this my 40th year. 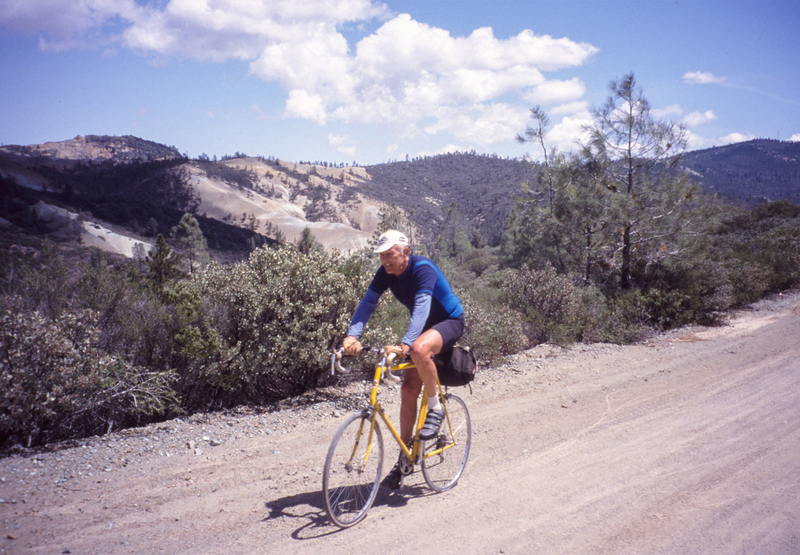 My numbers pale in comparison to Jobst Brandt, who holds the record for most 100-mile loop rides around Mt. Hamilton. Starting around 1954 he must have done well over 120 rides, ending the tradition when he was in his 70s. Mt. Hamilton Road opened in 1877 to immense fanfare as more than 5,000 valley residents flocked to the summit for a grand celebration. 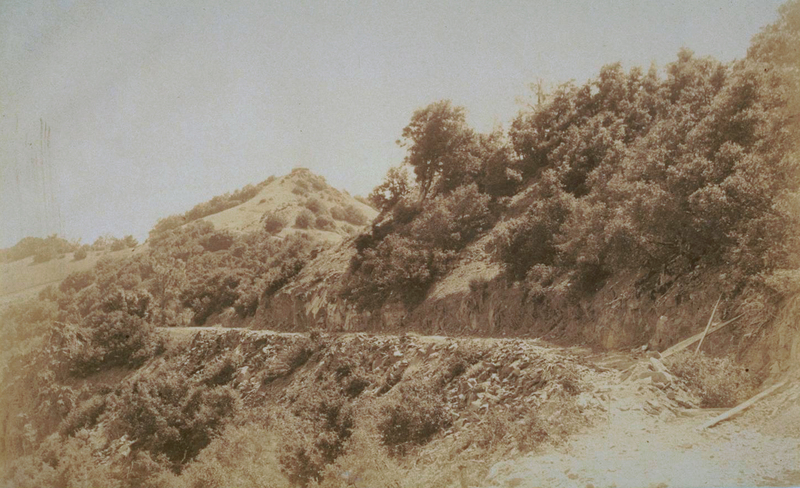 Here’s a view of the road in 1876, shortly before it opened. I don’t know the location but it’s probably somewhere in the last five miles before the summit. Imagine a modern mountain bike bombing down that dirt road right after it opened. If only we had time machines. Mt. Hamilton Road in 1876 looking more like a mountain bike trail than a road. Sidewall gives out. The tube bulges here and rubs against the brake. 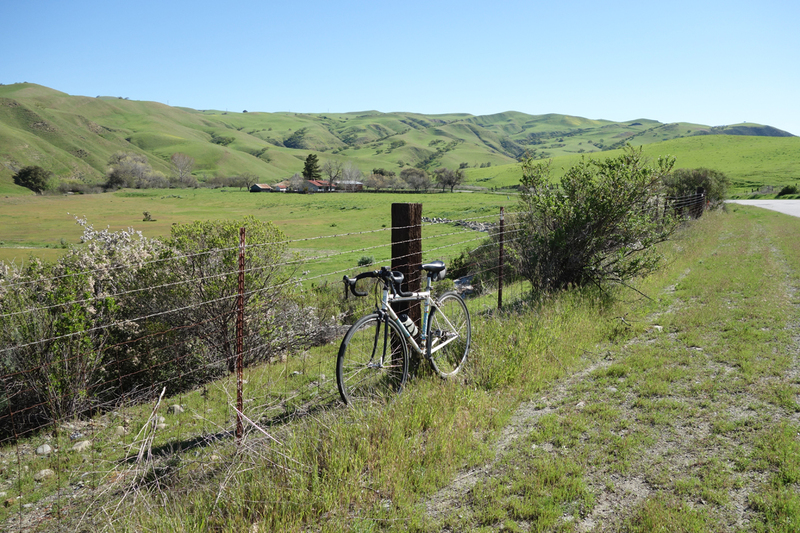 To take a line from Robert Frost, I had miles to go before I flatted, literally. I’m eating my words about that tire with 7,080 miles. I knew it was about to go, but I pushed it just a bit too far. I heard a pop, then a hiss and immediately sensed I had a front flat. Fortunately I wasn’t going too fast down Redwood Lodge Road. I stopped and took off the tire. I found the flat after a short search — a half-inch tube split. Odd. I looked at the tire and didn’t see anything wrong. So I replaced the tube and inflated the tire. All looked normal. Doh! That was my mistake. All was not normal. Don’t change a tube until you know with certainty what caused the flat. A quarter mile down the road….hsss! bang! Schiesse! No cell connection out here, I knew I had to get it right this time. Once again I tried to find the source, carefully inspecting the tire. There it was — a blown sidewall at the bead. Those are hard to see unless you carefully inspect the tire after inflation. Look for a small bulge. Fortunately I always carry a boot. I wrote about the importance of carrying a boot in a previous post. It’s tricky to get it positioned just right over a sidewall failure. Be sure you don’t see a bulge during inflation, which means that the boot is properly seated. I prefer an old piece of tire (minus the wire bead) versus an inner tube, although I also carry a piece of inner tube, which works well for holes on the top of the tire. I’ve had a sidewall failure before, but I don’t recall the details. It almost always happens on old tires with too many miles. In addition to a boot, bring money. In a bind I could have gone door to door and begged for a tire off someone’s bike. I’ve also seen dollar bills used as a boot. Bills are stronger than regular paper. Serves me right. I kept the tire pressure around 50 psi and took it easy riding home. I added two new Continentals, an UltraSport II ($17) economy tire made in China and a Gatorskin. I’ll rotate the tires and give the wear results in a couple of years. I’m not concerned about performance these days, just tire life/wear. 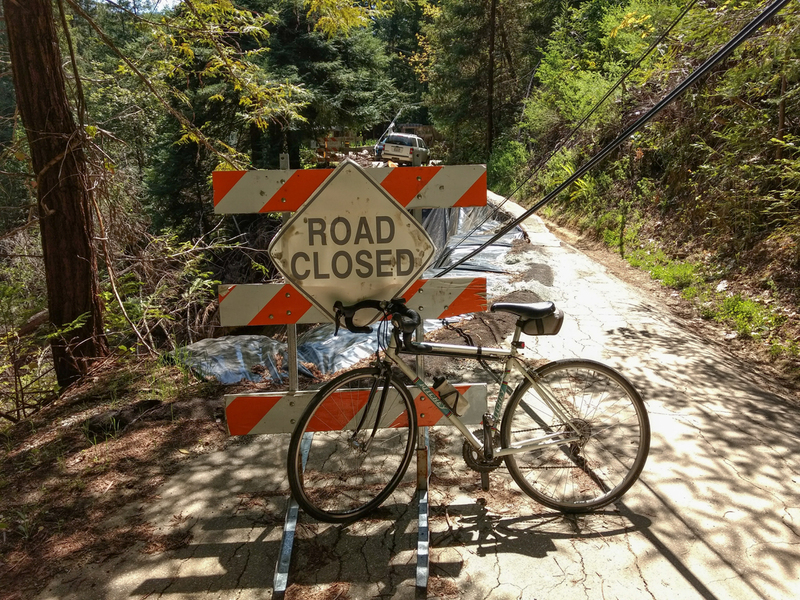 Today I headed into the Santa Cruz Mountains to look for another newt crossing sign and to find out what was up with Redwood Lodge Road and Schulties Road, both closed by washouts in the 2016-17 winter. Most cyclist have never heard of these roads. They’re not popular with road riders because they’re either unpaved or pothole city. Mountain bikers don’t ride them because they’re just dirt roads. Boring. Nice sign. Located on Alma Bridge Road near Soda Springs Road junction. That left Jobst Brandt, who loved riding them. 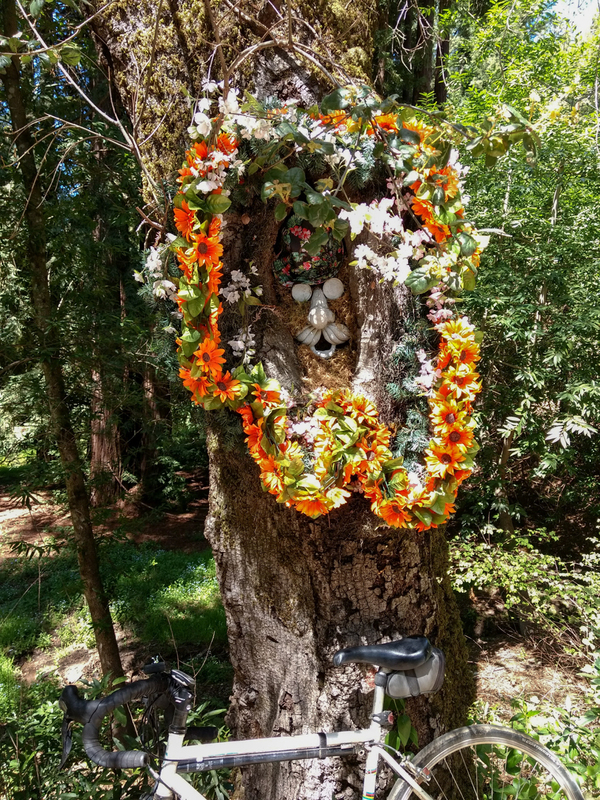 He had his reasons, mostly because he could check out the Laurel tunnel where the South Pacific Coast Railroad snaked through the Santa Cruz Mountains into Santa Cruz. These roads were instrumental in helping build the railroad and for hauling out redwood from the Laurel sawmill in the early 1900s. But today they’re only used by people whose homes reside there. I turned off on Morrell Road, another goat path ignored by cyclists. 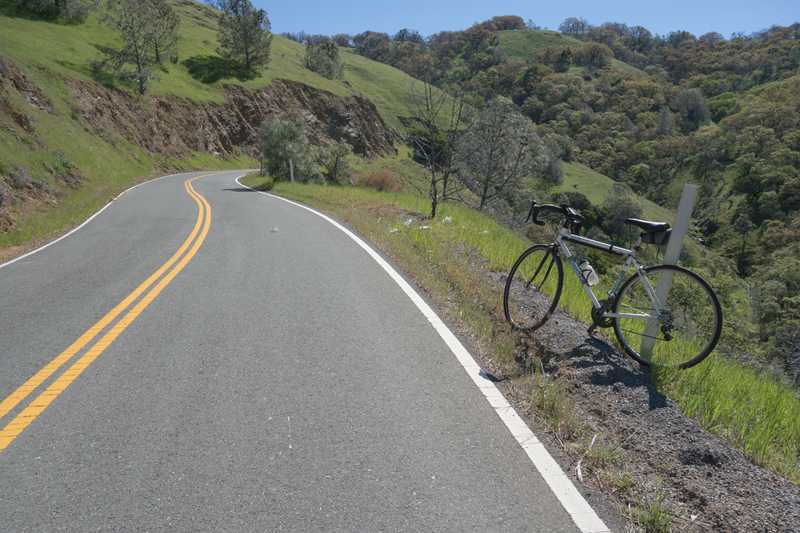 It cuts across from Summit Road to San Jose Soquel Road, offering a steep descent and climb, but it’s delightful if you like riding without cars. Once onto Redwood Lodge Road I saw the “road closed” sign and sped on by. I had tire problems, but more on that in the next blog. When I reached Burns Creek I found that the road had partly washed out and the county has gated the road. The sign says private property, which can only mean that the county has abandoned the road. The right of way reverts to the land owner. The county website says it’s under review. We’ll see. Location of the slide that closed Redwood Lodge looking east. I was reminded of another ride here in August 1982. The road just before Burns Creek was blocked by a landslide. 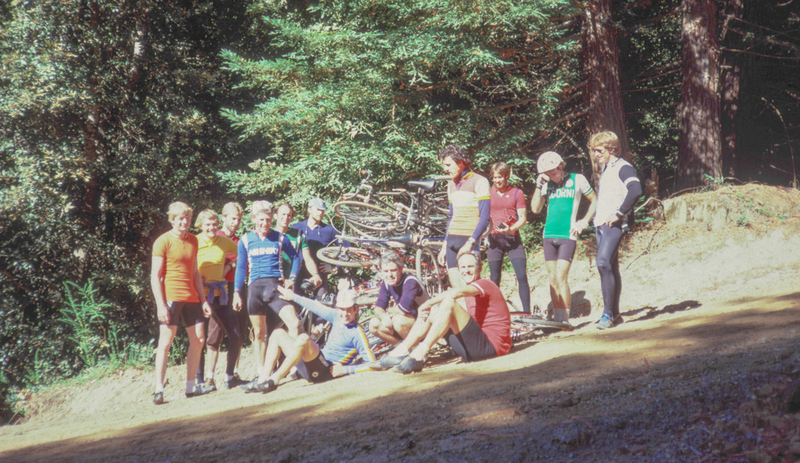 As Peter Johnson braked for the landslide on a steep descent his front tire burst. But I digress. I continued on up the road and found the section that was closed off in 2017, unchanged. The landslide has not been touched. I walked my bike up the stairs and headed to Laurel. A sign warned me that Schulties Road was closed a mile ahead. That road had a slipout and now there’s a narrow ledge with a down power line. It too had not changed since my visit in 2017. Schulties Road slip hasn’t changed since 2017. I walked across the ledge and picked up the road. Schulties was paved eons ago, but it’s mostly dirt now. I noticed that the landslide I came across in 2017 has been fixed, but a little farther on there’s another small slide, mud oozing across the road. 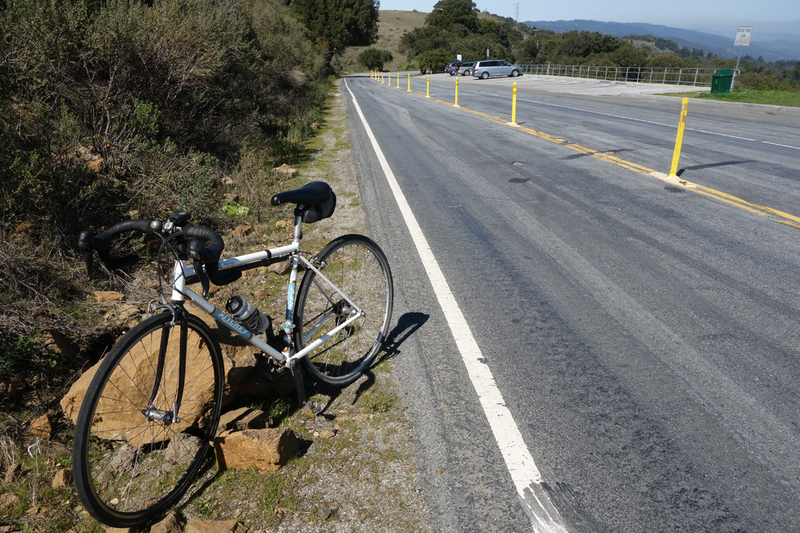 I dismounted again and then picked up the road, in good shape the rest of the way to Old Santa Cruz Highway. Another small slide on Schulties Road. It’s sad to see roads go away, especially when they’ve provided so much pleasure. Santa Cruz County has suffered so much road damage in the past three years that it has appealed for more funding, state and federal. Folk art on paved Schulties Road. Someone has a sense of humor. I saw a couple of locals walking on Schulties Road, under clear skies and warm weather in the redwoods. I told them that this is probably my last time riding here. It’s been fun. It was not more than a minute or two after passing a smashed newt — flat as a pancake — while climbing Alpine Road that I came across an oh-so-cute “Newt Xing” sign. A lot of good it did that poor fellow back there on the road. 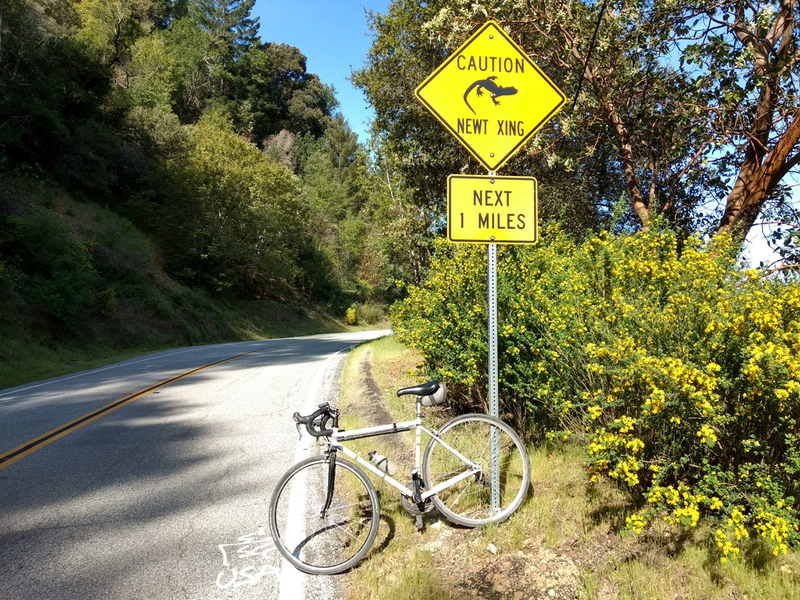 Ever since the San Jose Mercury News published a feature about a scientist who is documenting the newt slaughter that takes place annually on Alma Bridge Road (and elsewhere), these signs have been springing up. I’m told there is now a sign — like this one I presume — on Alma Bridge Road. I’m not sure who’s behind the effort, but I question its efficacy. It’s well intentioned, but what is a driver supposed to do? Newts don’t wear reflective vests in the dark. That’s probably when most of them meet their fate. Can’t we think of a better way than posting a silly sign? It turns out Caltrans is working on it. So give it another 20 years before we have a plan. 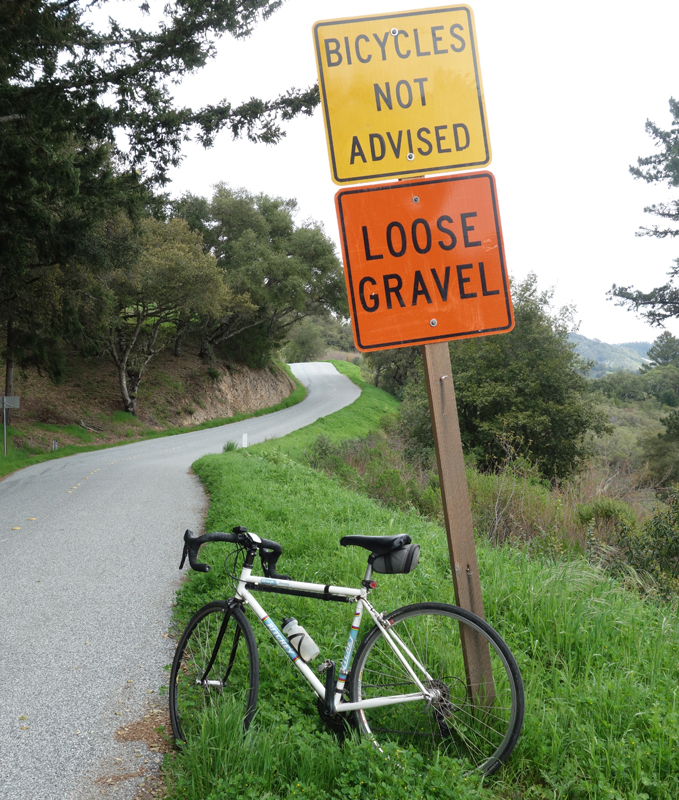 Another sign that rankled just about as much is the San Mateo County warning for bikes: “Loose Gravel Bicycles Not Advised”. I think it’s safe to take down these signs now. I’m guessing Alpine Road and Stage Road were graveled about a year ago, or longer. There isn’t any gravel to speak of, except small patches on the roadside where wheels never tread. When there is fresh gravel, watch out. I avoid freshly graveled roads when possible. Although I used to think that traffic in the Santa Cruz Mountains wasn’t different on a weekday compared to a Sunday, I’m changing my mind. There’s way less traffic on a weekday, but that only applies to the west slope. Stage Road lovely as always. I’ve seen my share of drivers hurrying to work coming down Page Mill Road, Moody Road, you name it. On my way into Pescadero I saw seven enormous tour buses blast by on Pescadero Creek Road, most of them chartered by Sierra Pacific Tours. I wish they’d find a different road, like Highway 84. 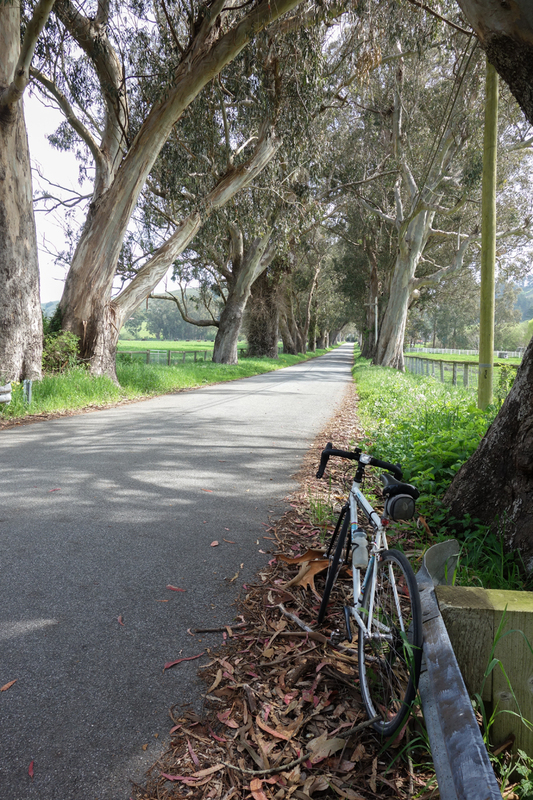 Pescadero Creek Road is too narrow for those giant tour buses. One of these days the new Loma Mar Store will open. Jobst Brandt and friends always stopped there for food and drink on the way to far-off destinations. 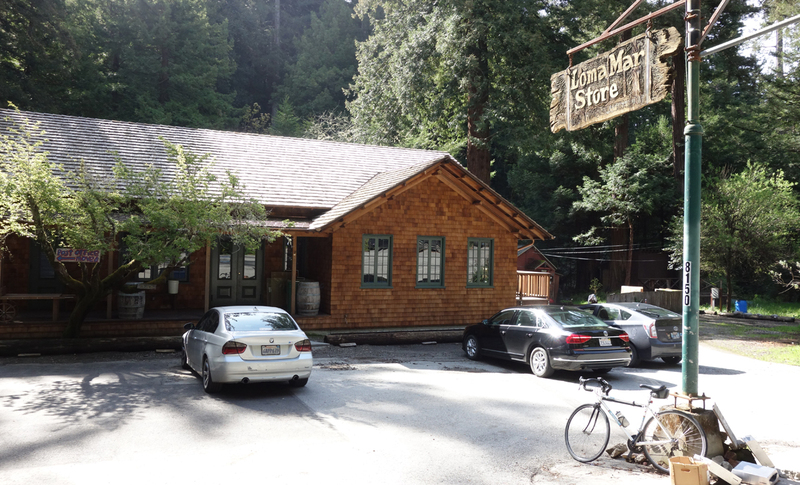 It doesn’t have the funky charm of the old store, but new Loma Mar Store opening will be a momentous occasion for the locals. Meanwhile, sleepy Pescadero has an ATM machine and a new bank. At least I don’t recall seeing one. 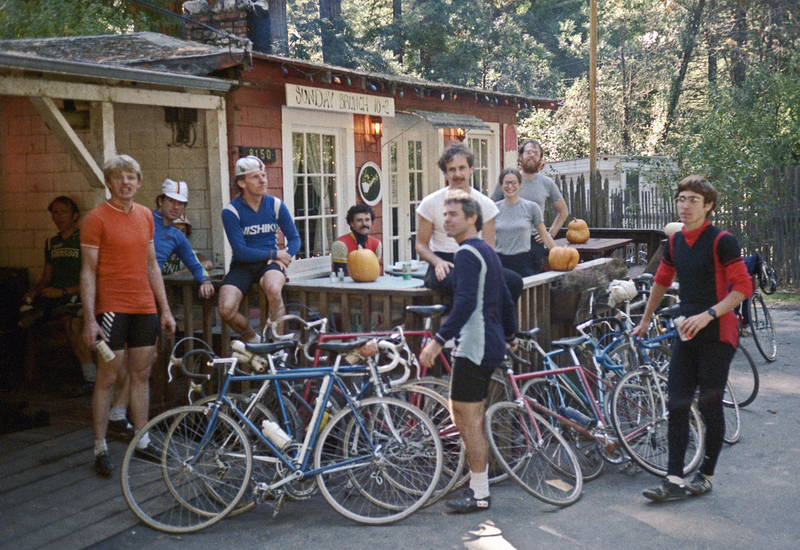 Bike pile ride Nov. 4, 1984. Early mountain bikers join Jobst riders. Butano Ridge Trail. This had to be the best day of the year so far for weather. No that was last weekend. Two weeks in a row. Delightful. Stage Road overlook after the first climb going north. Breathtaking. This Continental Grand Prix 4000 S has 7,080 miles, and counting. On March 20, 2017, I installed two new Continental Grand Prix 4000 S II 700c Road tires on my Ritchey, and they’re still going strong. 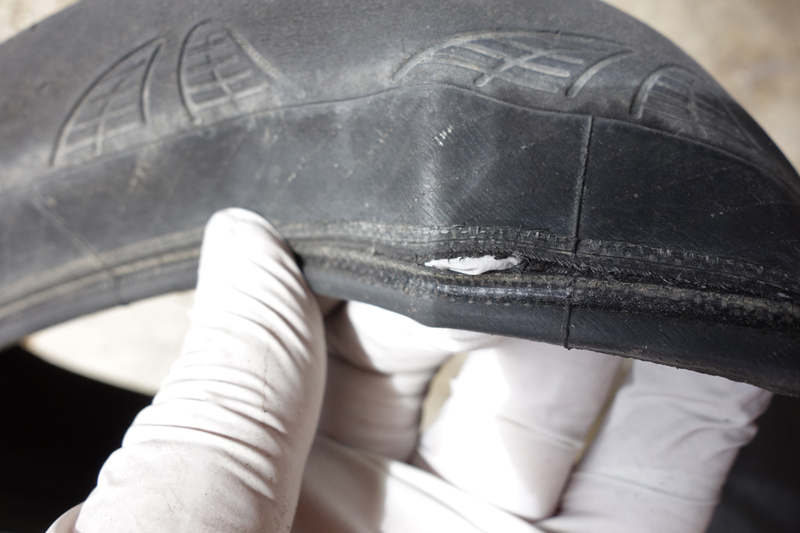 There’s only a tiny spot with sidewall fraying. That’s a sure sign that this tire’s days are numbered. I’ll only tempt fate so much to save a buck. The tire has some flattening from wear, but I don’t think it’s all that bad. I’ve seen worse. I’ve only had one flat. An increase in flats is another sign a tire is worn out. I ride three other bikes, but those miles were omitted in my calculation. My last tire with a record for miles was a Continental Gatorskin 700×28. It lasted 5,400 miles before I chucked it. The Continental Grand Prix only cost $35, way less than the $52 I paid for the Gatorskin, back in 2014. So what gives? Why would a cheaper tire last longer? 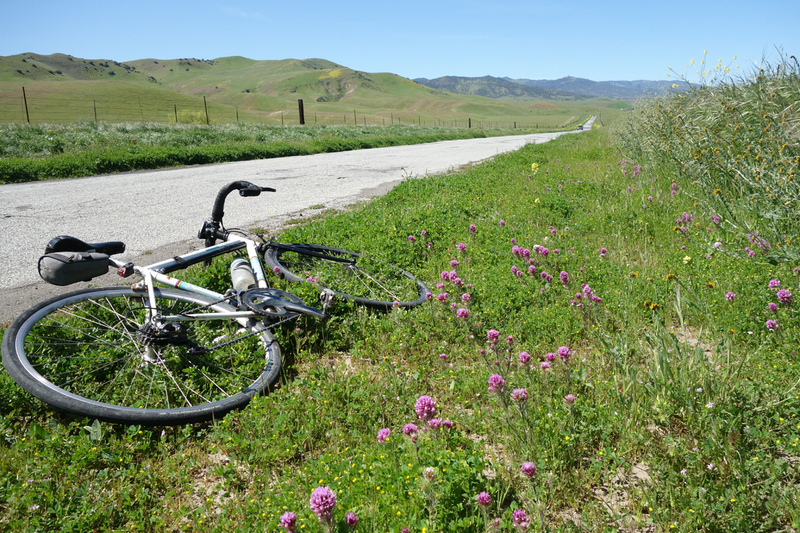 I attribute most of it to how I’m riding these days — flat roads with little debris. In 2014 I rode a lot of dirt, mostly in the Santa Cruz Mountains, so the tires were stressed way more than they are now. 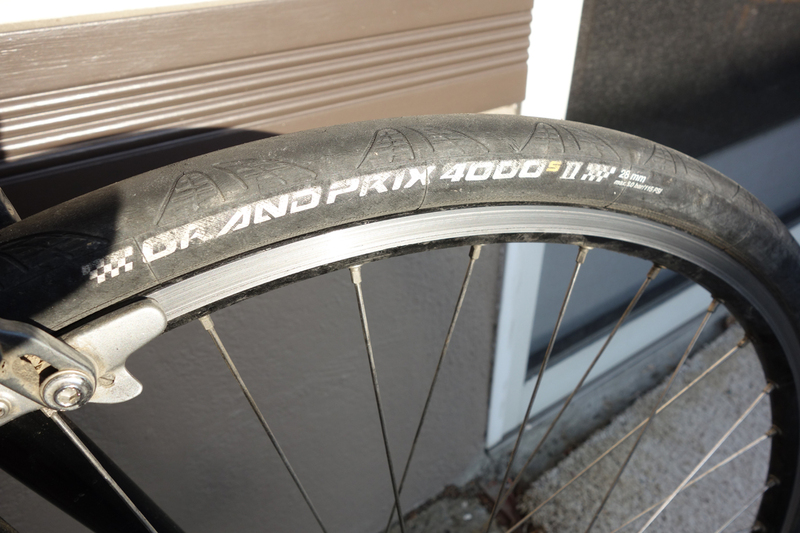 To be sure, the Continental Grand Prix 4000 S is a well made tire, one of the best. It’s still being sold, for $34-$40. A welcome sight no matter which direction you’re riding. When we started riding to New Idria in 2003, we didn’t see too many cars as our ride group headed home to Paicines via Panoche Road. Sixteen years is a long time in Silicon Valley years, so it came as no surprise that I saw a fair amount of traffic on the way home today. 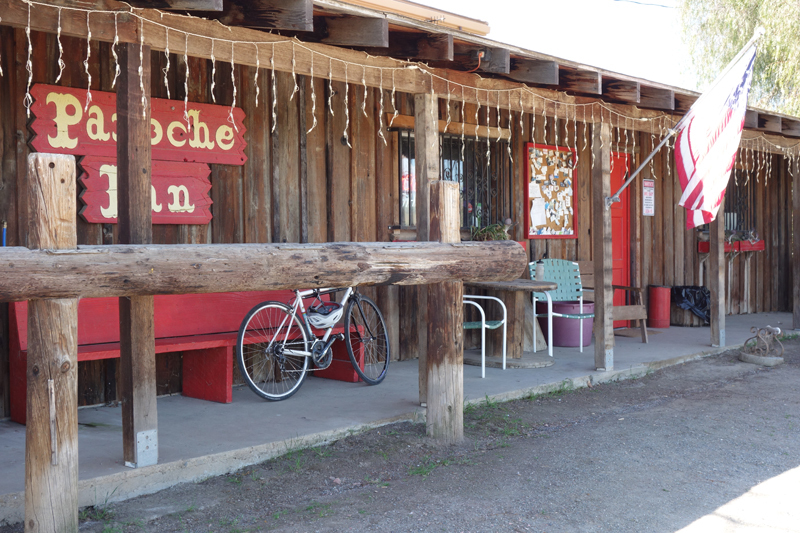 The 12 p.m. departure from Panoche Inn in the heart of Panoche Valley made it peak travel time, which didn’t help. So what’s going on here? Well, for one the dirt bikers have switched their riding from Clear Creek to New Idria and environs, where county roads are still open, free of BLM harassment. Quite a few of the trucks driving by had dirt bikes. I must have seen 20 big RVs driving the narrow, bumpy road. Where did they come from? I’m sure some motorists driving sedans were looking for the mythical Super Bloom. Sorry, it did not materialize, but I saw plenty of wildflowers after a wet winter. Owl’s clover on Panoche Road, at Panoche Valley looking west. Finally, ConEdison’s 247 MW solar farm is taking shape. It probably doesn’t generate much traffic on a Sunday, but I can imagine it would on a weekday. Panoche Valley solar farm in the distance, or is this a mirage? As I sat in a Panoche Inn lounge chair looking at the distant emerald green hills, contemplating life and how it’s constantly changing, I saw what looked like a shimmering mirage, or a lake. I looked closer and, sure enough, it was solar panels. After years of environmentalists throwing up roadblocks, ConEdison finally started building, albeit it’s greatly reduced in size from the original plan. Panoche Inn, under new ownership. In the bar, I talked with the new owner. The dollar bills still hang from the ceiling. The weather gods showered me with mild temperatures, sunshine and fair breezes. The hillsides burst with colors. 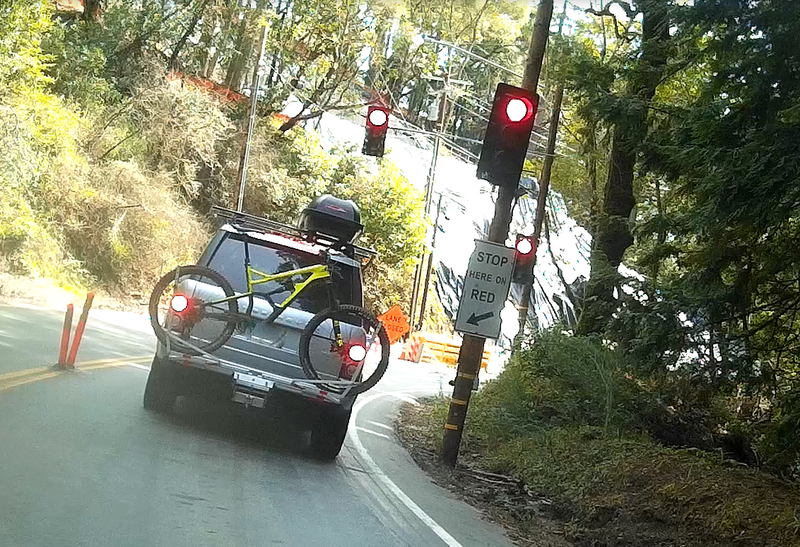 There’s a narrow window here for best bike riding. Once the rains go away, the land turns a drab brown. Green hills, the way you want to see them on this ride. I finished riding at 2:30 p.m., 55 miles in the saddle. Such is life in the slow lane. 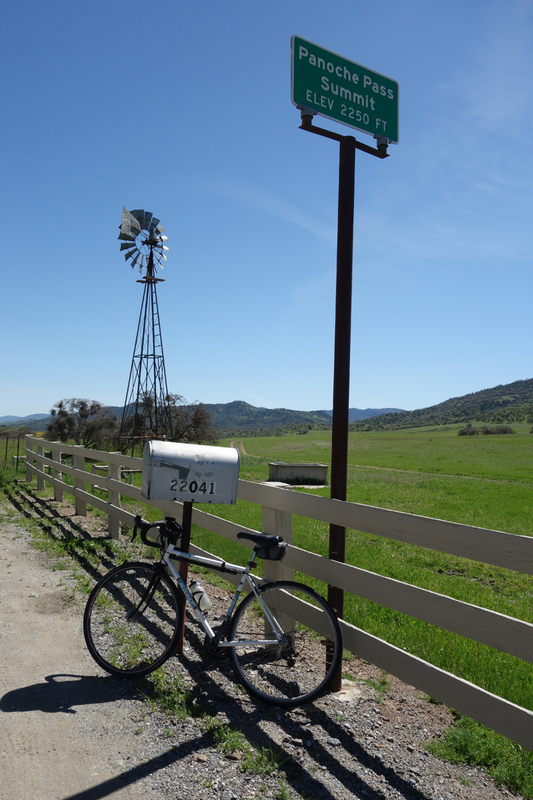 After the ride I learned that Judy Garland’s third husband owned a ranch in Paicines, and the “town” used to be called Tres Pinos, which today is now three miles up Hwy 25. Parents of Lieutenant General Janet C. Wolfenbarger, the highest-ranking woman in the United States Air Force, live in Paicines. It’s a small world. 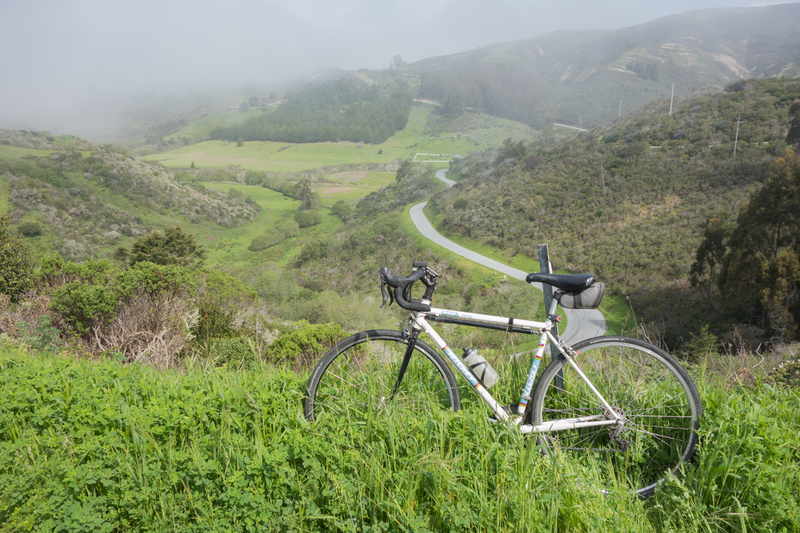 I decided to check out the slide on Skyline Boulevard that’s 0.87 miles west of Skylonda. The damage to the upslope is substantial, so there’s a lot of equipment in place to fix the hillside. That’s why there’s a stoplight. Half the road is taken up by heavy equipment. Looking at November 2017 Google Map images of this location, there was already sagging in the hillside. I don’t know when it got worse. 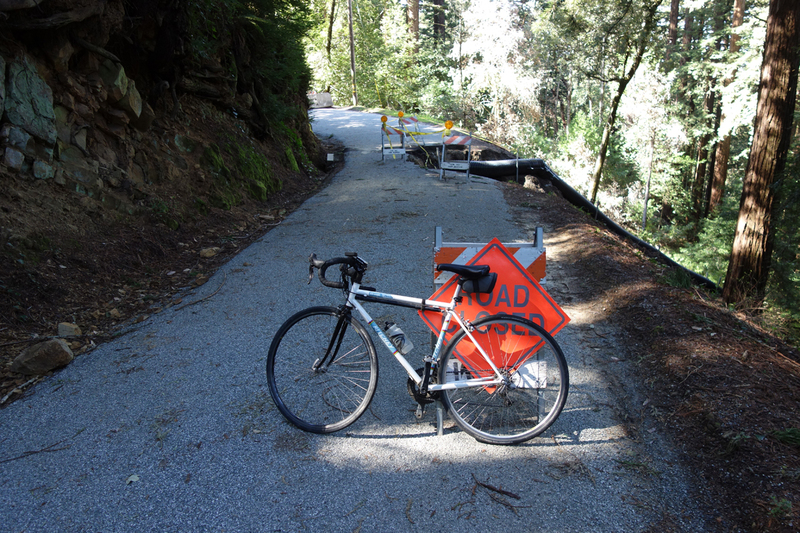 The good news is that Kings Mountain Road is free of mudslides, although I rode through Huddart Park, so I didn’t see the lower section. I think traffic drives too fast on Skyline, but that’s just me. Also, I thought the days of muscle cars came and went in the 1960s. Many cars I saw qualified as souped up Hemi-engine growlers. 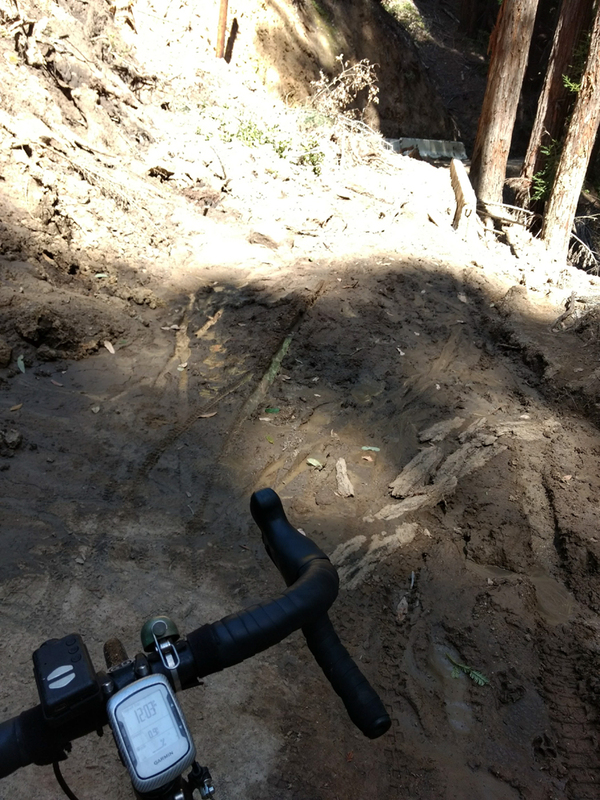 Old La Honda Road west had a culvert meltdown. Culverts can be blamed for many road problems. 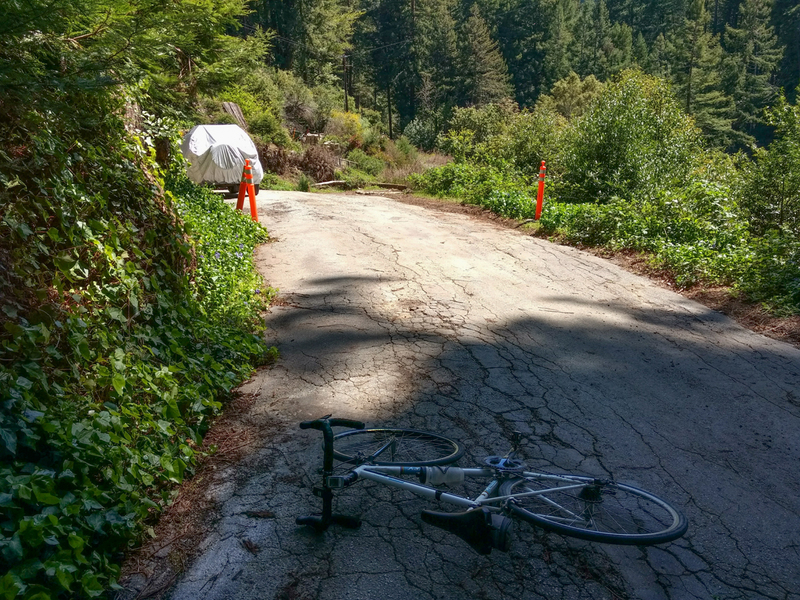 As you already knew, Old La Honda Road (west) took a hit this winter when a chunk of road 0.3 miles south of Skyline Boulevard fell downslope. Two concrete barricades make it impossible for cars to get through. This slide resembles the one in 2017, 3/4 mile downhill. 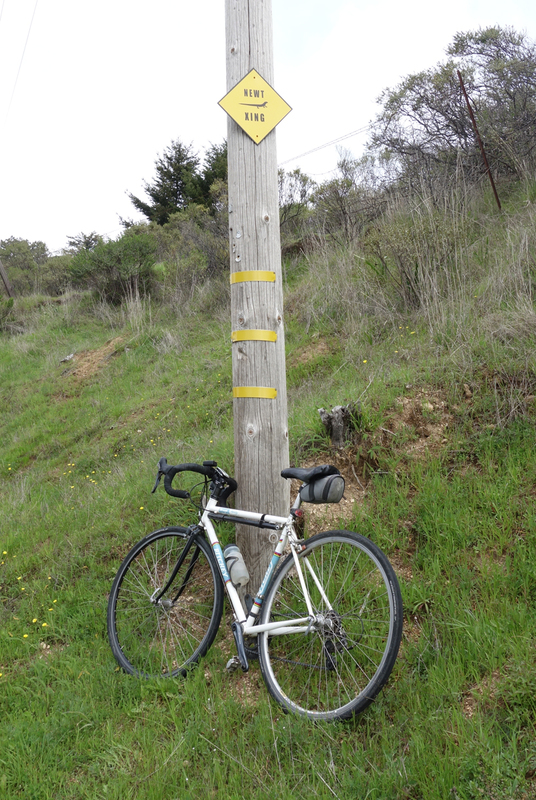 I had other plans, so I continued south on Skyline Boulevard. I was none to happy to see the yellow markers installed down the middle of the road at the scenic overlook. Is this necessary? Now cyclists have to ride through a narrow section that will make car encounters unpleasant. Drivers often hit 60 mph on this stretch. Let’s hope they slow down here. Today was one of those days when you wish you were young and strong again. Such lovely weather and so little traffic. Whoever approved this abomination has no empathy for cyclists. Black ice sign on Moody Road deserves your attention. Shade, freezing cold, wet is a recipe for black ice. 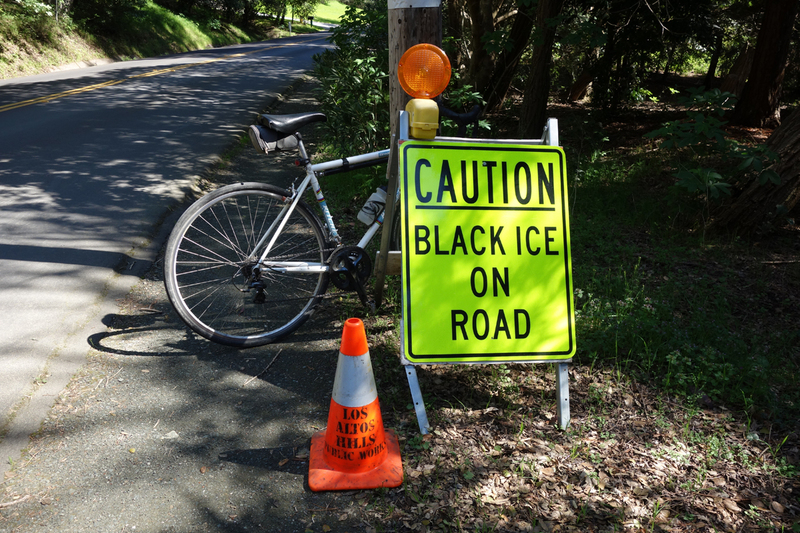 It’s too late now, but a few weeks ago this sign served as a reminder that black ice lurks in the Santa Cruz Mountains on cold mornings. If you hit black ice while riding, in all likelihood you’ll fall. It’s so slippery that it takes just a few inches to bring you down. My black ice encounter went as you might imagine. On a cold, frosty morning climbing Page Mill Road, about a mile up from Moody Road, I was following right behind Jobst Brandt. Hey, I didn’t see anything. That’s why it’s called black ice. You don’t see it until you’re on it. Follow this precaution: It’s more likely found in shady or wet areas when the temperature drops to freezing. In my case it was not all that shady, but it was a steep spot where water oozed out of the road. 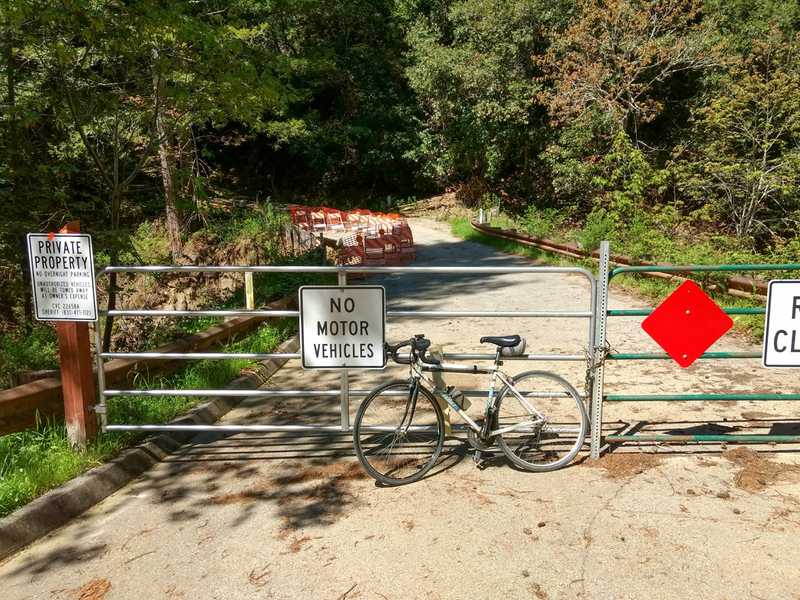 Los Altos Hills has a history of posting bad road signs, but this one gets a big thumbs up.